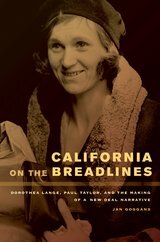 California on the Breadlines is the compelling account of how Dorothea Lange, the Great Depression’s most famous photographer, and Paul Taylor, her labor economist husband, forged a relationship that was private—they both divorced spouses to be together—collaborative, and richly productive. Lange and Taylor poured their considerable energies into the decade-long project of documenting the plight of California’s dispossessed, which in 1939 culminated in the publication of their landmark book, American Exodus: A Record of Human Erosion. Jan Goggans blends biography, literature, and history to retrace the paths that brought Lange and Taylor together. She shows how American Exodus set forth a new way of understanding those in crisis during the economic disaster in California and ultimately informed the way we think about the Great Depression itself. Jan Goggans is Assistant Professor of Literature at the University of California, Merced.